This is page 1 of the series, Stalking the Lost Villas of Naples. 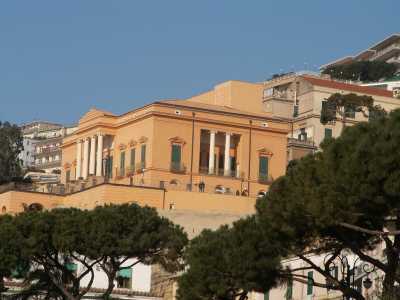 A great number of named villas were built in Naples from the 1500s through the early 1900s. They were purposely built outside the crowded urban nucleus of the city and usually named after a single head of family, often a nobleman. Isolation and titles not being what they used to be, those exclusive villas have almost all been encroached upon by urbanization and subdivision. There are a few exceptions such as the Villa Roseberry on the Posillipo coast; it has resisted civilization only because the entire property was appropriated by the Italian state to be a presidential residence. (Other exceptions would be the Villa Pignatelli and the Villa Floridiana; the former is a museum, the latter a public park and museum. As well, such buildings as the villa Aselmeyer—technically called the Aselmeyer castle—so stand out because of the architecture that they have become monuments in their own right and are easy to spot.) Some of the villas have simply been demolished, but quite a few still exist; they are “lost” in the sense that they are now surrounded by the “background noise” of overurbanization. This series deals with a number of the "lost" ones. There are nine main items with photos on these two pages; the first 5 are on this page. At the bottom of p. 2, there are links to separate entries on other villa. On page 2: villa Ricciardi, villa Leonetti, villa Winspeare and family, Pioggio dei Mari; link to the Villa Craven and others. One such “lost” building is the Villa Belvedere, located on what was once the bucolic southern slope of the Vomero hill, overlooking the sea. You can find it if you know where to look; some hint comes from the name “Belvedere.” There is a via Belvedere in the Vomero section of Naples; branching off from the road, there is smaller viale Belvedere, which, lo and behold, terminates at the villa Belvedere. The villa was built in the late 1600s by a Flemish merchant, cited in sources as “Ferdinando Vandeyeden” (Also cited as Vandeneynden. Both versions are probably mistakes or at least variations of the common Flemish name, van der Heyden.) The architect was a monk from Bologne, Brother Bonaventura Presti—architect, carpenter, engineer and all-round Baroque factotum in Naples in the service of archbishop, Ascanio Filomarino. Presti also helped design the main port facilities in Naples and contributed to the Spanish remake of the San Martino monastery. The villa Belvedere was built in the years 1671-1673. The villa itself was expanded greatly in the 1700s. Those changes still define the villa; it was truly a residence of royal proportions, a sumptuous vacation spot for the likes of Queen Caroline, consort of King Ferdinand; later, the villa was one of Murat’s favorite spots to get away from it all. Entry was from the north along the tree-lined viale Belvedere, then through a rear gate into the courtyard of the villa, itself; you can still pass through an arch in the main building to the terrace and garden in front, a large rectangular embankment still resting on the series of high, arched loges dug into the tufa hillside when the structure was expanded in the 1700s. The loges formed essentially a basement to the villa and served for storage. Today, the southern and western panoramic parts of the building sit directly on a road built in the 1920s, via Aniello Falcone, a major thoroughfare, one of the main roads up to the Vomero section of town. As well, the villa is flanked by modern buildings and is, itself, subdivided into various “apartments”. (The premises also house a nursery school.) Yet, even today, the villa is set high enough to overlook most of the encroachments from the 1900s. As strange as it seems, it is still a little bit of the mid-1700s lost in the big city. The entire length of the Posillipo coast and hillside —from the Mergellina harbor out to the promontory that separates the Bay of Naples from the Bay of Pozzuoli— has attracted artists and poets ever since the Greeks sailed into the bay thousands of years ago. The area remained largely undeveloped until a road, via Posillipo, was built between 1812-24. That road starts at sea-level at the Mergellina harbor and moves up the coast to the cape. Even photos from a mere century ago show the coast and hillside to be still largely a wooded area. Overbuilding since the end of WWII has now made it difficult to pick out from the mass of recent buildings some of the grand villas that were built in the early 1800s. Once such structure is the Villa Doria d’Angri, built for prince Marcantonio Doria between 1831 and 1836. If you stand at the seaside a bit past the Mergellina harbor and look above the road as it starts its route up the coast, the villa should jump out at you, even though it is no longer the solitary structure it must have been when it was built. The architects were Bartolomeo Grasso, Antonio Francesconi and Guglielmo Bechi, who worked with a large team of artists and decorators to construct this grand neo-classical mansion replete with Pompeian atrium and fountains, all with a stunning view overlooking the bay. Some of the premises has fallen victim to the “death of a thousand cuts” over the years—large outdoor vases, statuary, and furnishings have disappeared, for example, as have the painted tapestries from the villa’s “Chinese room.” The villa is known for having been the residence of German composer, Richard Wagner, when he was in Naples in 1880 as a guest of the English family that had acquired the villa. 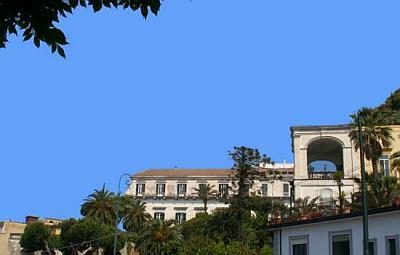 The premises have been acquired by the former University Naval Institute of Naples--now "Parthenope" University--and serve as an academic and cultural venue. The complete earlier name of this villa—Ruffo-Palazzolo-Haas—reflects the history of ownership. The original villa was put up in the late 1700s by marquis Donato Tommasi (1761-1831), a prominent member of the Royal Chamber of Deputies of the Bourbon government. The property was then sold to cardinal Fabrizio Ruffo (famous as the leader of the counter-revolutionary Army of the Holy Faith, which overthrew the Neapolitan Republic in 1799). At Ruffo's death in 1827, his nephews sold the property to the princess of Palazzolo (a noble name going back to the 1200s and found throughout Italy). Her children then sold the proper to Enrico and Clemente Haas in the late 1800s. The original property was 38,000 square meters—about nine and one-half acres—on the southern slope of the Vomero,almost in the shadow of the gigantic Sant' Elmo fortress just uphill and to the east. It had a few other lovely, distant villas for company (including the villa Belvedere—see top of this page), but in those days the Vomero was not developed at all (see Urban Expansion of Vomero) and there was plenty of room for rich elbows. After more than a century of urbanization, the villa is still prominent (because of its height—the upper stories are not original) but stands totally flanked and surrounded by buildings almost as tall; it is on via Cimarosa directly across the street from the Vomero station of the main cable car (which opened in the 1920s). The entrance to the villa (in the shadows at the lower right-hand corner of the photo) leads through to the back of the property and one sees how those original 9 1/2 acres have been developed. It has all been subdivided and built on, although if you follow the path to the very back, you can still look out and see the bay. In the 1927, upper stories were added and the facade was redone in sort of a mixed "Liberty" style by architect Adolfo Avena. It was part of a general plan to remake the square in front of the cable car station. For that reason, the building is also called Palazzo Avena. The complete name is villa Genzano-Majo (also Maio), a villa in back of and below the giant St. Elmo fortress on via Gerolamo Santacroce, which winds down the steep eastern slope of the Vomero hill. It is directly across from the small Augustinian church of the Madonna of Buon Consiglio. The villa still bears the neo-classical touches of the original construction, a style very popular in the late 1700s, when it was built. It still commands an unobstructed view of Mt. Vesuvius. The builder and original owner was Giovanni Andrea de Marinis, the marquis of Genzano (1755-1824), who availed himself of the considerable architectural services of the Tuscan, Antonio Niccolini, (1772-1850), the person who restored the San Carlo theater in 1816 after a disastrous fire and whose other works in Naples include the construction of the villa Floridiana. Marinis’ life was touched by the tragedy of seeing his only son, Filippo, executed by the restored Bourbon monarchy for having supported the republican revolution of 1799. The marquis’ daughter married and ownership of the property then passed to the Majo family. The villa was also referred to as the Villa all'Infrascata, the old name for today’s via Salvator Rosa, because the villa was at the beginning of the long carriage ride down the Infrascata, the road down to Naples. The villa was for a while the residence of composer Gaetano Donizetti. The villa is today subdivided into a number of apartments; and the property includes premises behind the front building seen in this photo. taken from what used to be part of the original property. Few villas in Naples are as buried by the "background noise" of urbanization as this one. Villa Patrizi is located at the eastern end of current-day via Manzoni, the long road that runs along the top of the Posillipo hill. The nucleus of the villa was built around 1740 and was part of the early Bourbon wave of villa construction at the time. The building is now at a busy confluence of three major roads and is surrounded on all sides except the south by buildings put up since WW2. Nevertheless, it stands out and sits high enough to have a good view of the bay to the south. bit of red façade in the background. The property originally belonged to marquis Francesco Palomba di Pescarola. The current owners tell me that the propery originally (i.e., in the mid-1700s) extended down the southern slope of the hill almost to the sea at Mergellina, which means that it was, indeed, vast. The property was acquired in the latter half of the 1700s by Pietro Patrizi, who was the procuratore (state prosecutor) on the Bourbon Royal Council of State. He made the villa into his country estate and hunting lodge. At that time, the entire estate included structures to the north, now on the other side of via Manzoni (i.e., out of sight to the right in this photo.). Patrizi was a well-known good host and the villa counted as guests the likes of the king of Naples, the emperor of Austria and other royalty as well as a long list of poets and artists. Sources say that the original portal of the building (still intact) is by the Neapoltian architect Ferdinado Sanfelice (1675-1748), who is said to have contributed, as well, to the small "villa theater" on the premises. That theater was long a cultural venue in Naples, indeed even well beyond WWII but, sadly, was destroyed by fire in 1998. It was then sold, and although there has been some hope of restoration, that has not yet come to pass. The extent of urbanization of the area is evident in the bottom two photos; yet, in spite of that and all the sell-offs and subdivisions over the years, the building is still quite impressive; it has a courtyard and three floors and still has a garden terrace on the south and some trees on the west.